River canoeing on safari is a wonderful activity. 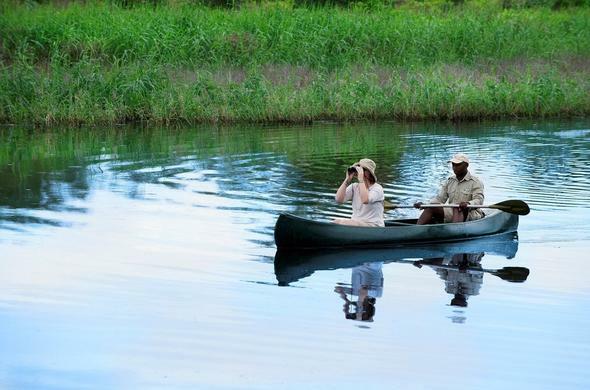 Enjoy peace and tranquillity in the wild as you explore the back waters of KwaZulu-Natal. The sway of the canoe and the dip and splash of your paddles as you glide along set up a gentle rhythm which is deeply relaxing. Many people underestimate the value of being on the water in a wilderness area. Going on safari is not about how many of the Big Five animals you can see on intrepid game drives. It should be an adventure into the unknown and an exploration of your surroundings from the ground up - there is so much to experience and discover.At Phinda Private Game Reserve in northern KwaZulu-Natal the range of safari experiences is one of the most comprehensive and includes canoeing on the Mzinene River. This delightful activity offers superb birding opportunities and you may also be able to see wildlife drinking at the water's edge. Canoeing takes place in the early morning and in the afternoon. Your armed ranger will take you on a game drive through the reserve to the riverside where you transfer to the waiting canoes. The riverine forest is lush with huge trees and interesting plant life.Phinda is a Big Five reserve and home to about 350 bird species. The river is edged with reed beds and overhanging vegetation where you could spot Weaver birds and the Scarlet-Chested Sunbird, or Red-Billed Quelea, the Goliath Heron and African Finfoot.The tall trees along the riverside are favoured by the African Fish Eagle and Osprey. The Malachite Kingfisher is a common sight and you will probably see African Jacanas stalking across giant lily pads. You may also spot bigger animals such as Crocodiles, the odd Hippo and sometimes Elephant.Along the way you will stop for a rest and a drink on the shady riverbank where your ranger will answer any questions you may have and share his knowledge about wildlife in the surroundings. Later, depending on the time of day you go canoeing you could end off with breakfast or tasty sundowners by the water before returning to your lodge. Phinda offers an exciting safari experience due to its location between the Indian Ocean and the iSimangaliso Wetland Park which is a World Heritage Site. It offers superb accommodation at 6 luxury lodges which are situated in different areas to make the most of unique eco-systems within the reserve - Forest Lodge, Mountain Lodge, Rock Lodge, Vlei Lodge, Zuka Lodge and The Homestead.Activities include twice daily game drives, bush walks, canoeing and cruising, also available are snorkelling and scuba diving, deep sea fishing, Rhino tracking, horse trails, birding and photographic safaris, family safaris, Leopard research safaris, Turtle safaris, walking safaris and village tours. Phinda Private Game Reserve is open year round and canoeing is part of the daily choice of activities included in your safari. Canoeing can be enjoyed at any time of the year and there are highlights associated with each season. Winter usually yields a longer time on the water because the temperatures are cooler. Game viewing is best between March and September.Phinda is located in the southern Maputaland region which experiences a sub-tropical climate with hot, humid and wet summers from September to April. The winters are dry with temperatures ranging from warm to cool between May and August.